Natureplex of Olive Branch, Mass., is recalling about 74,000 packages of Well at Walgreens Pain and Itch Relief Cream. The packaging is not child resistant as required by the Poison Prevention Packaging Act. The product contains lidocaine, posing a risk of poisoning to young children. 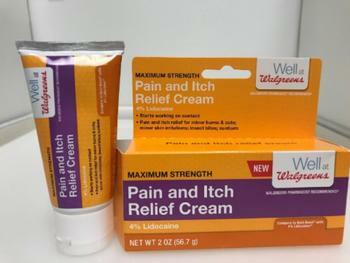 The recalled Well at Walgreens Pain and Itch Relief Cream tube and packaging are orange with a purple stripe with “Maximum Strength,” “Pain and Itch Relief Cream 4% Lidocaine” and “NET WT 2 OZ (56.7 grams)” printed in white on the front. The Well at Walgreens logo is located on the front upper right corner. The packaging contains the UPC bar code 3 11917 18962 8 on the back. The cream, manufactured in the U.S., was sold exclusively at Walgreens stores nationwide and online at www.walgreens.com from March 2017, through November 2017, for about $7. Consumers may contact Natureplex toll-free at 866-323-0107 from 9 a.m. to 5 p.m. (CT) Monday through Friday or online at www.natureplex.com and click on Product Safety Recall for more information.